Backing up image files in preparation for my leave-taking. A bittersweet experience because there are soooooooo many photos of my artwork that I never even shared. I spent the past 8+ years feeling wildly behind schedule and, because of this, often didn’t share as much as I would have liked to. With success came a clamor of commissions and with that a very long wait list. I found it difficult to know how to make each person feel as special as I wanted them to feel. And so I stopped posting my artwork photos. I’m sorta sad about that. There is a beautiful story to be told in those images. I lived a life so full that in some ways it became a burden. And yet…I can’t imagine it having been any different. Such a long winded challenge that was, and yet I’m also grateful for the prolific amounts of art, travel, friends, clients, animals, life and love that my life contained in these past many years. As I work on remaining commissioned pet portraits, I find myself feeling invigorated by the newness of the work that lies ahead of me in Africa. With each painting completed, an entirely new space of freedom opens up before me. With that freedom comes sparks of inspiration. Where will art take me next? 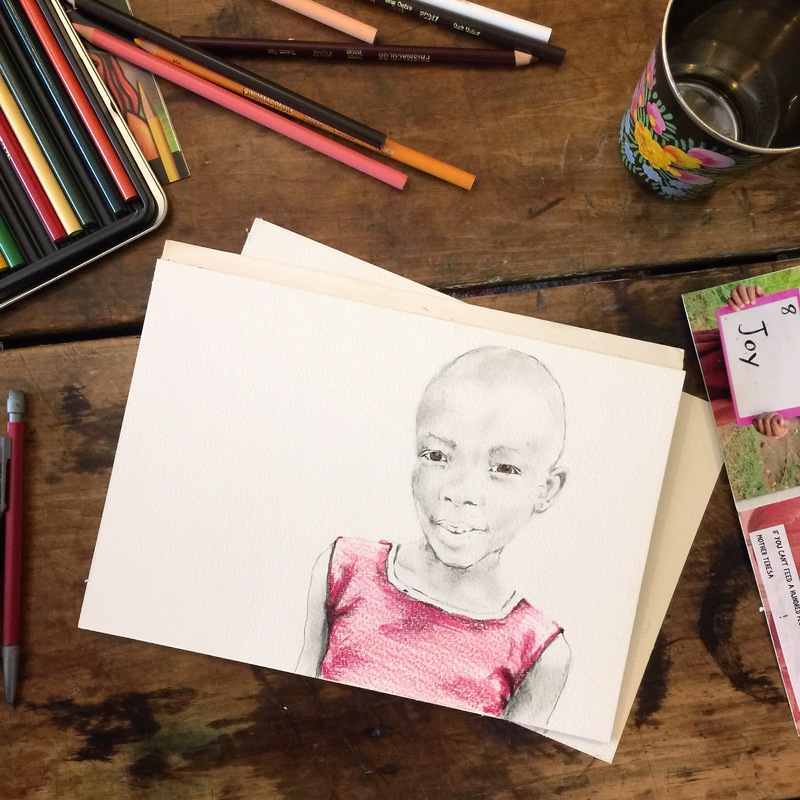 In Africa, will I have time to paint? Will I even be able to source the supplies I need to so? I’ve already got a head full of ideas that want to be expressed. A whole life, really, that simply wants to be expressed. Transfigured: gems in the perfect setting. Today I purchased my ticket to East Africa. Everything in me begging to return, this will be my second trip since August. This time, I will stay for an entire month. I feel restless today. There was some confusion with the tickets since the prices started to sky-rocket and, although I knew the cost would eventually go down again, I worried about the availability of decent flights or even getting a seat if I waited too much longer. After much searching, there turned out to be only one option and that was to fly into Entebbe, Uganda via Nairobi, Kenya. Normally I would have flown in via Rwanda. I’m a bit disoriented by this turn of events, but feel that God has a definite plan. You see, I had prayed about it and felt guided to go through Kenya. I considered this, but then got turned upside down and attempted to stick with my original, seemingly less complicated program. I laughed out loud when going through Kenya ended up being my only option, the details aligned beyond my control. I surrendered. And now? I will land in Kenya on the evening of my 41st birthday and then, by midnight, be stepping out into a Ugandan night. A new year, a new life. And, for this, I thank God. You’d think I might pair this wonderful news with a happier photo, but in all honesty, this is the image I’m most drawn to tonight. I’m fighting a fever and feeling both the gravity and beauty of the world. My friend, Poppy, recently sent me an article from Vogue featuring Kenyan actress, Lupita Nyong’o. We were having a conversation about portrait photography–beauty and dignity, intelligence and humility–and the art of illuminating the soul. We talked about “putting the right light on the jewel that is in the right setting.” Poppy’s words struck me as stunningly exact. Yes. Even in the worst situations, the most dire circumstances, the most impoverished places, that is exactly the thing I want most to look for. If there was one thing Carl taught me, it was to see beauty where it would otherwise be overlooked. I am returning to Africa to begin a new life (tragedy has a way of offering such gifts), returning to begin laying the groundwork for future work in building opportunities for widows and children. Starting with seeds. Yes, literally. The most basic ingredient of growth and development. How apropos. I will be meeting with some amazing individuals to plan and discuss as well as exploring Eastern Uganda to look for that place that God has set aside as Home. I will be meeting with my camera crew kids that I worked with back in August. Oh, my precious kids, I cannot wait to wrap my arms around each one of them! Most importantly, I will also be meeting with my first group of widows and their families in order to photograph, interview and simply spend time together. 10 women. It is through their time and willingness to so openly share that will get this project successfully off the ground. It is not something I am doing “for” them, but rather with them. We will be a group of 11 widows with a willingness to rebuilding our lives and, perhaps in the process, inviting others to rebuild along with us. We are starting with nothing but our own dust and ashes and, in this way, I feel we are exactly where God intended us to be. That is all. Earlier this week I was given guidance to dream bigger. I’m already a pretty big dreamer and so…to dream BIGGER? Yeah, I’m willing to give it my all…even if I don’t entirely know what that even means just yet. This morning I have been looking through images from Bududa. I can’t seem to get from Point A to Point B in my editing endeavors in any linear fashion because I get distracted by the sheer beauty that so many of these photos contain. 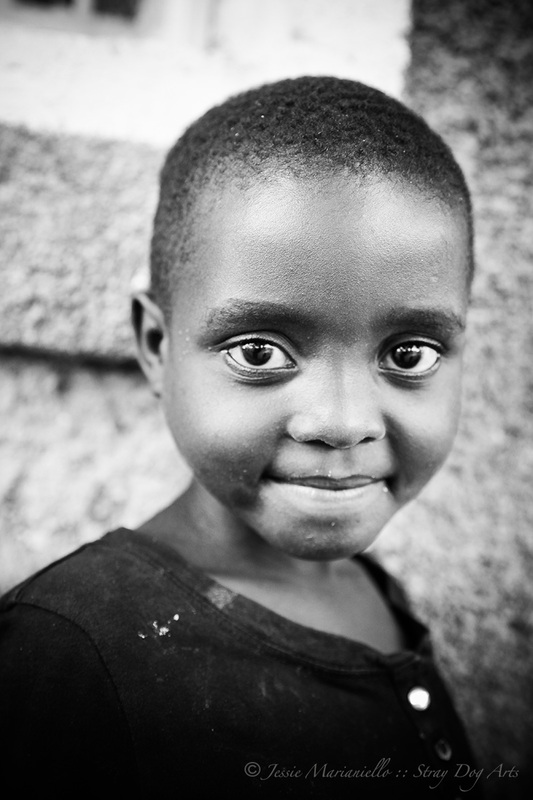 This little girl’s name is Mutenyo Evelyne. She hung out with us a lot while we were working in Bududa. She was as curious and sweet as her eyes might lead you to believe. I’ve had her photograph open on my computer since Tuesday because her eyes have captured me, her expression creating a peaceful stillness buoyed with possibility. Dream bigger, her eyes say. I want this girl to dream as big as she possibly can. And I want to dream right along with her. 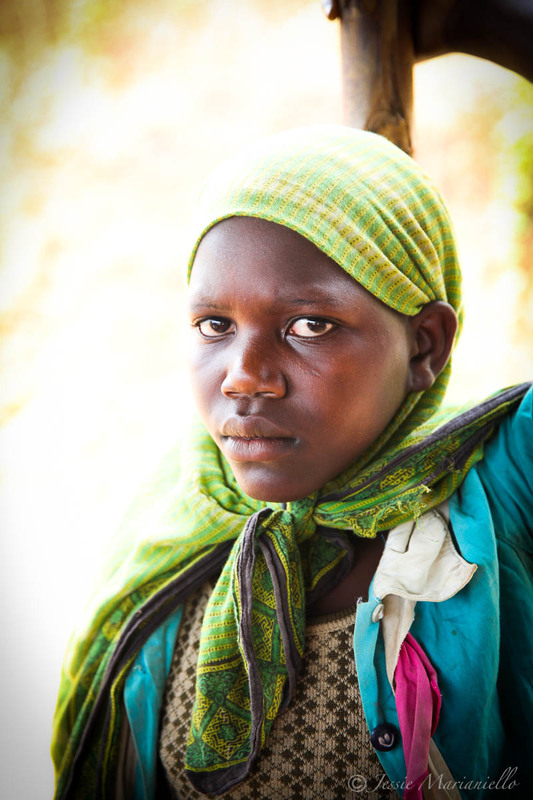 When I left for Uganda, I didn’t really know where God would end up leading me. I knew I was going there to photograph, document, and tell the stories of a particular group of kids and their community. I went there as a Hands of Action volunteer, but the entire time leading up to the trip and even during the time of my stay, my deepest prayer was, “God, plug me into where I am needed most!” I wanted to find my place in this great wide world of need. I wanted God to use me. I trusted that He would. I wanted more than a 3 week experience doing short-term mission work. There were moments when I prayed, “Oh, dear God, please don’t leave me hanging without a sense of place after this is through.” There was a bit of desperation under the surface of that prayer, but He listened to my heart on that one, too. He has a plan. And you know what? I am falling for His plan hook, line and sinker. lol I’m laughing as I write that…only because it’s true. I’m not even aware of when, exactly, “it” happened. It was incremental, perhaps a bit like the way a baby grows. You don’t notice how fast it happens when they’re in your arms all day long every day, but eventually you turn around and and can’t believe the change that’s taken place! I left for Uganda with a backpack full of camera gear and several journals. Included in all that gear were a few point and shoot cameras that had been donated after a last minute moment of inspiration to capture photos from the kids’ point of view. Little did I know how important those inexpensive little cameras would become! Actually, I have a feeling that even I still don’t know the full potential of this new journey that I have so divinely been sent on. This is what the good stuff is made of. 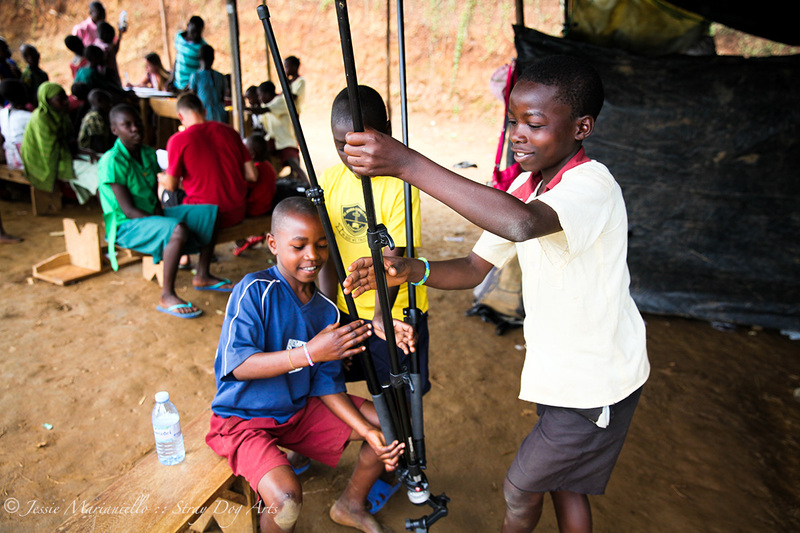 Meet my Camera Crew (below): Emma, Emma (a common boy’s name in Uganda) and Godfrey…just three of the fourteen kids that became a committed and integral part of a photography project that I haphazardly pulled out of thin air just days before leaving. God is GOOD! That project changed everything. As my dear friend Moses would say, it is giving me the way forward. I’ll tell you more about the camera project in future posts, but for now let me just say that the kids took it seriously. Very seriously. It was also my doorway into getting to know the community in a much more intimate way. Those involved became my special crew, my students, my interpreters, sherpas, guards and best friends. They were eager to participate and learn in every way possible. We were a team. It didn’t matter that we sometimes spoke a different language; it didn’t matter that we came from opposite ends of the earth. We found a common thread and I daresay it has woven our lives together for good. Emma, Emma and Godfrey, eager students learning how to use a camera tripod. Since the moment I left African soil, I’ve been obsessed with getting back. I keep saying that I can’t wait to dive into the work that awaits me there. My friend Poppy finally asked me, “Jessie, what IS the work you are going to be doing now?” Ahhh, such a simple, yet powerful question! Leave it up to Poppy to get down to the brass tacks. I believe in these boys. This is the look of limitless possibility. I am working to further develop the camera project as a means of creating continued education and opportunities for the kids involved. I am working side-by-side with Hands of Action Uganda to grow a micro-loan lending system/cooperative group to help widows get back on their feet after significant loss. I am helping with the photography, rebranding and websites for Hands Of Action Uganda and Hands of Action International as well providing social media and content in the form of photography, stories, and video. Last, but not least…I am sooo drawn to work with orphans on some level. I will give that time tho. I have a feeling it is something that will come to me if and when it is meant to be. Needless to say, all of this seems like as good a place as any to start. When I asked God to use me, He didn’t hold back! In all honesty, I am overjoyed. Meanwhile, I am preparing for a solo exhibition of canine painted portraits with my whole heart. This show is over two years in the making and it is also what is going to propel me into the Whateverafter. See those kids in the photos above? I believe in them. I believe they can do anything. Emma (left) has a heart of gold. He is gentle, observant, and thoughtful in ways that make him stand out like a shining star. Godfrey (right) is quieter and a bit more likely to go unnoticed in the scheme of things…oh, but that boy, more than any of the others his age, has an eye for detail! Every single one of the kids that emerged to be a part of the camera project is remarkable in some way. Let this be just the beginning of limitless miracles. It is my hope that the camera project will cause those involved to see the world with new eyes. It is my hope that it will forge a path towards continued education…perhaps someday even creating an opportunity for a university education. If given a chance, what might these kids be capable of? How many other lives might they touch in the process? All I know for sure right now is this: I want to find out. Dear Abba, thank you for this journey you’ve set me on. Make me Yours…over and over and over again. You have touched me to the current of new water. Everything before this led to now and everything beyond this leads to what is still to come. May Your grace be limitless. Teach me how to dream BIGGER. Teach us all. Dear Abba, I love you. Goodbye old studio. Hello new life. Yesterday I locked the door of my old studio for the very last time. It was a good place. The light was soothing and the floors were warm. The ceilings were high and the breathing space plentiful. It was the studio space that I moved into with the help of Carl. We had big dreams and that place was a perfect fit. From the very first day, I felt protected by divine forces whenever I entered. Truly, it was an amazing feeling and I trusted it. I moved in only one month before Carl died. Little did I know then, what a true Godsend that studio would be for me over the coming months. When Carl died, I died right along with him. It was many months before I was able to work again, but it was that studio that drew me forth out of the dark confines of my bed and into the warm and sunlit interior of this creative space. Most days, I didn’t really accomplish anything, but even the act of showing up was the miracle that slowly worked its healing magic on me. For many weeks and months, that’s all I did. Show up. Slowly, but surely I found myself producing new work. Sometimes just to satisfy myself and other times to fulfill client obligations. In either case, the progress, however slow, was a gift beyond measure. My clients may never know just how truly important they have been in this process of healing. God knows, the utmost patience has been required on their behalf…and I thank them for that. Before leaving for Uganda, a very special opportunity came up. My friends, Emily and Karen, two immensely talented artists, were looking for studio mates. I’ve always had private studio space and am not in the habit of creating in the presence of others. And yet…something about this felt so right. SO very right. I already knew the space they were working in, but went once more to look at with new eyes…the eyes of using it as my potential new workspace. I walked in the back door and it was an immediate YES. There was only one stipulation: I would rent 3 of the 5 spaces and, beyond us (and a quiet, fairly non-existant artist renting in the basement), we would keep it a private space in order to eliminate the possibility of too much white noise of more renters. It happily fell into place for all of us and I planned on moving in the day after getting back from Africa. This move would afford me the opportunity to reallocate my budget to accommodate one or two more trips to Africa per year. I didn’t yet know what Africa would do to me…but something in me DID know to prepare! God had handed me an opportunity and, gratefully, I accepted. I need to admit that it was harder than I expected to make the transition. And even as I write those words I am grateful that the transition is occurring. You see…moving out of my old studio was, unexpectedly, a huge process of letting go. Letting go of a life I had planned with Carl. Letting go of his daily presence in that space. Letting go of a whole lifetime leading up to the gifts of Africa. Every single day that I walked into my studio, I would walk through the door, turn to the right and see Carl’s hardhats and Yeti cooler that I had them sitting on. I would say hello and tell him I loved him. Of course, Carl wasn’t physically there, but something of his spirit lingers in those items and it felt so good to have that moment of connection and gratitude with him each day. I would then walk to the back of the studio and reprogram the microwave clock to 12:34. Every. single. time. I walked in the studio. 12:34 was our “I love you” number. Even after his death, Carl was woven so thoroughly into that space. I always felt his spirit close to me there. I knew how much he loved to see me working hard. I knew how much he wanted to see me happy. I knew how much he would want me to live…no matter what. I let that space heal me. In the cold of winter and into the briskness of spring, it was a loving cocoon of warmth and light. I felt surrounded by guardian Angels. I prayed and painted and painted and prayed. God infused every brushstroke that happened in that space. He infused me. I cried and painted, listened to endless sermons and worship music. Some days I even danced or smiled and laughed. My heart poured itself out into that space and was equally filled with new hopes for the mysterious future that I could feel waiting for me on the horizon. How stunningly apropos that my move would take place immediately after returning home from Uganda. I never intended things to work out this way…but God did. He knew all along. Oh GOD! How does He so truly and deeply know everything in my heart? The task of moving was overwhelming. I wasn’t expecting all the emotions that it would bring up. Not to mention, I wasn’t feeling well (fighting something intestinal…yay, 3rd world travel!) and, of course, a bit jet-lagged. As usual, I had been overly optimistic in my abilities after such an intense journey. BUT! Then Carl’s family showed up. They didn’t even know I was struggling. They simply did what a loving family does best: SHOW UP! First Carmita, then Christine and Lauren…they saved me from much floundering and tears…and the best part? I did not even ask! Such a gift. I felt soooo spoiled. So incredibly, incredibly blessed! And so…now? I have a big pile of canvases, inventory and STUFF to unpack and organize in my NEW space. It seems that the weird interior of my artist’s mind has exploded in a cluttered mess of the studio floor. I find myself standing on new ground. Both literally and metaphorically. I feel myself stepping wholeheartedly into the rest of my life, into this story that God had written for me all along. I will always love Carl. Africa has shown me that it is possible to love him forever and yet also to completely move forward. I broke when he died. I fell apart. I was smashed into a million pieces. But something about that mountain in Eastern Uganda put me back together in a way that defies language. It’s a process that I’m still living out…but the best part is that I feel as tho I am truly LIVING. My heart is open. I am steeped in great love, even on this earthly side of heaven. I feel ready to live the rest of my life. Thank you, dear Abba. You are the one who saves me. Over and over and over again. and that was the day my heart started coming back to life. And now? It seems I’ve handed my life over to Africa. A lot can change in 3 short months. Then again, a lot can change in a millisecond. As I write this, I feel the horrible moment of Carl’s death saddled side by side with the gift of God so thoroughly transplanting my heart to that red soil so far from home. One might have never happened without the other. Oh God, I wish it could have happened any other way, but in my heart of hearts…I know this is the story that has been written for me all along. My job is only to follow it. The great big question is this: What do I have to lose? There is immense freedom in immense loss. In a lot of ways, I can see that God was preparing me for this all along. At times, this is difficult to admit. It’s an acknowledgment that makes me want to kick and scream at all the pain and heartache I’ve traveled through to get here. And yet…here I am. I’ve been given two things: an invitation from God and the freedom to follow it. 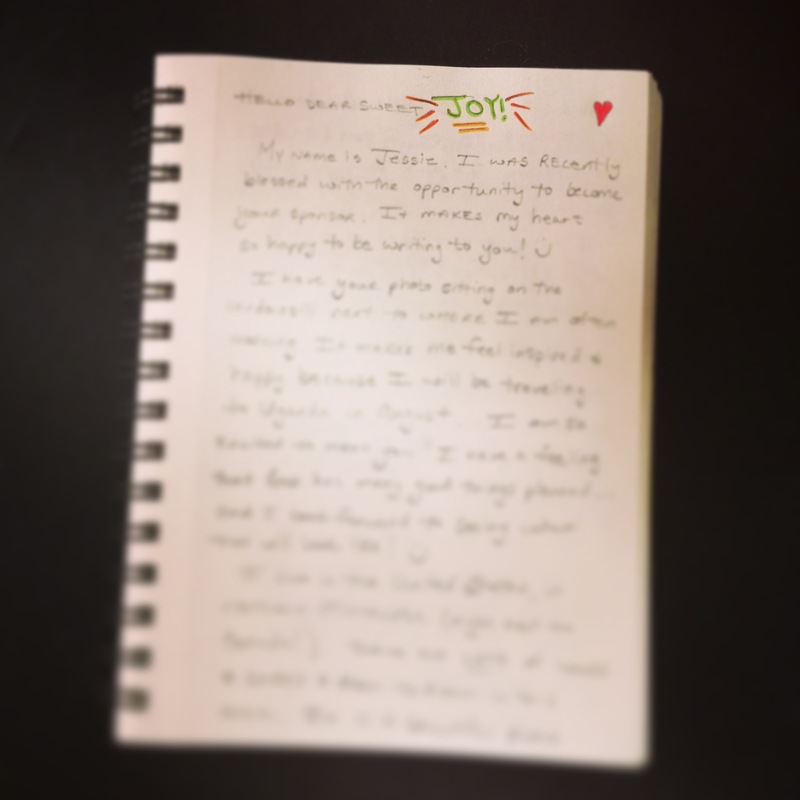 This past week, I finally started working on my first letter to Joy. On an allegorical level, my writerly brain spent quite a bit of time contemplating what one might write if the emotion of joy could be a real and living being. I can get as clever as I want, but the lovely thing is that Joy IS a real and living being! 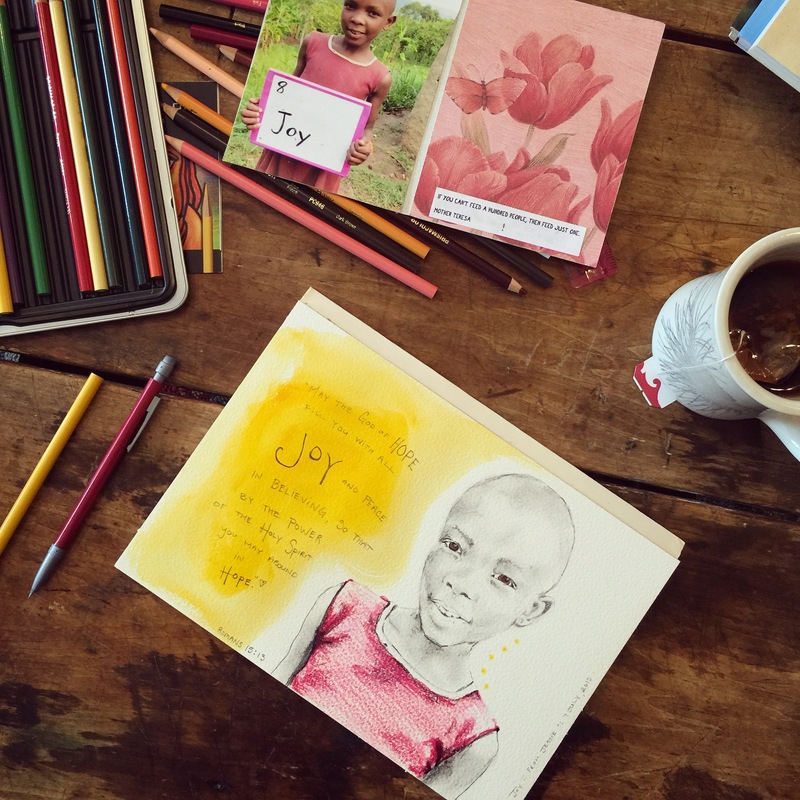 I found myself writing a letter to both joy and Joy all week long. One was to myself (sometimes my younger self, sometimes my current self, sometimes to my older self and sometimes to an imaginary entity all together), the other was to a young orphan girl in the mountains of eastern Uganda. In other words, it wasn’t just a letter. Something else was happening. It was (and is) God gently knitting things into place. To be honest, I’ve been a bad sponsor “mom.” I should have wrote to her a couple months ago. Then again, maybe the timing was just right because the letter turned into a portrait and, with every extra minute spent in communion with Joy, I felt my heart softening in ways that I might not have been able to experience earlier. I found myself starting to truly care for this little girl whom I’ve not yet met. I found myself falling in love. As I continue to work on painted portraits for clients, it was easy to sneak in short breaks to play with Joy’s portrait whenever I had time to spare in the in-between moments of my schedule. I found that I enjoyed mixing colored pencil with the monochromatic effects of graphite. Mind you, oil on canvas is the medium I normally work in. Everything else feels foreign! But it was good to stray off course for awhile. I find that the map God gave me has a significant number of routes leading me OFF-ROAD on a regular basis. The map I was once using has become all but useless. No problem. My old map played a fantastic role in all of this. Abba’s got this figured out perfectly. As joy begins taking up more and more space in my heart, I feel my energy returning. I’m not as easily run down. I have a better ability to put in a full day’s work in the studio. I’m not as easily overwhelmed. I’m eating much healthier. I’m getting more exercise. When Carl died, I died right along with him. Wholly. Completely. Friends and family and faith kept me on some sort of supernatural life support. My heart broke. It broke wide open. And then God gave me this. Joy and a new life. He took this mess and turned it into a gift of grace. God’s grace has a drenching about it. A wildness about it. A white-water, riptide, turn-you-upside downness about it. Grace comes after you. It rewires you. From insecure to secure. From regret-riddled to better-because-of-it. From afraid-to-die to ready-to-fly. Grace is a voice that calls us to change and then gives us the power to pull it off! In a few short weeks my lungs will be breathing in the air of Africa. As relationships deepen and connections accumulate, I realize that this is just the first step of many ahead of me. And yet, through the grace of God, I feel ready. I feel strong enough. I feel resilience creeping back in. I feel a continuous flow of happiness and joy, enough to bolster against the bad days and heartache that I’m almost certain to experience again in following this path. I liked the blank space of Joy’s portrait. 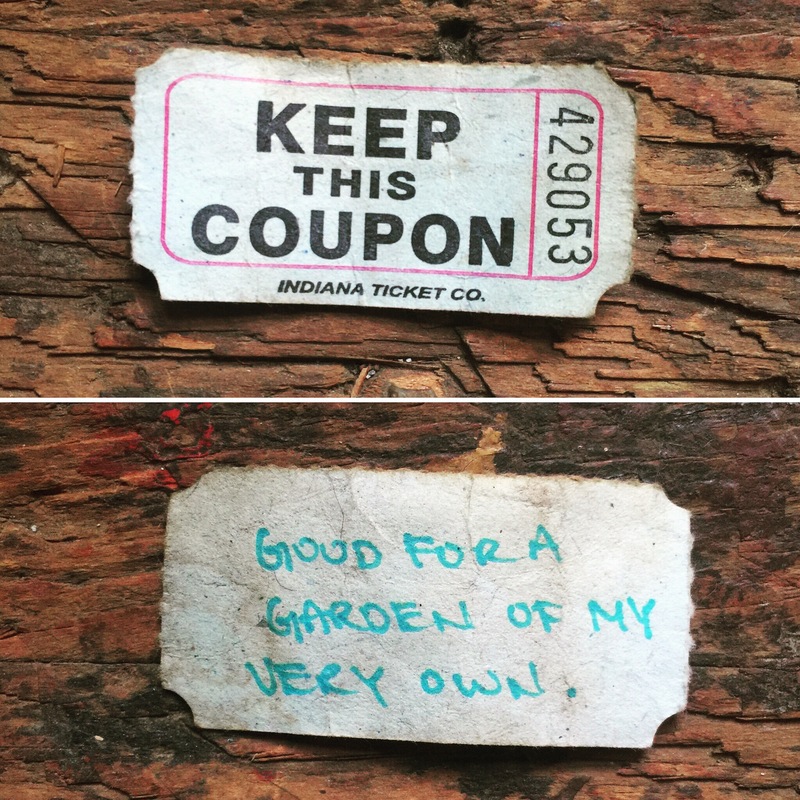 I liked that it still had something left to tell. I like the way we’re all in this story together. And yet I decided to fill the blank with a spill of bright light. Because JOY is a colorful space. It lacks nothing. May the same be true for this girl who I am only on the cusp of very barely getting to know. May there be enough light to spill over the edges. Dear Abba, ease our pain. Put color in our lives. Help us find our way, fill our hearts. I love you, I thank you, I am forever yours.